It has been reported that Wade Shows owned by Frank Zaitshik has been awarded the contract for the New York State Fair. James E. Strates Shows has provided the midway at the New York State Fair for the past six decades. As part of the agreement, Wade Shows will provide the midway for the next ten years. Click here for an article about the NYSF midway. Campbellsville, KY - The Taylor County Fair Association has announced that a contract has been signed with a new company to provide the midway at the 2014 Taylor County Fair. The new contract is with Miller Spectacular Shows based in Greenbrier, Arkansas. “We are very excited to be bringing in what we believe will be a very high quality midway and hope this is the beginning of a long-term relationship for our Fair and Miller Spectacular Shows,” said Mike Litchfield, President of the Taylor County Fair Association. The local fair was notified on November 18th, as were all Kentucky and Tennessee Fairs that Myers International Midways had decided to downsize their operation and not return to any of their fairs in Kentucky, Tennessee and other states. “Like all the other fairs, we were shocked and disappointed to lose a great carnival like Myers and we give them a lot of credit for helping grow our fair during their four years with us. In large part, because of the growth we’ve experienced, we were able to attract interest from several companies and Miller Spectacular Shows reached out to us early in the process. The more we learned about them and met with them, the more we realized they were the midway provider that could best help us to continue our growth into the future,” said Litchfield. Miller Spectacular Shows has been in business for over 50 years and is operated by Johnny and Sue Miller along with their son Freddy and his family. 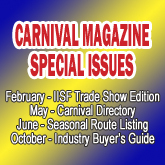 According to the carnival’s website, “the show started as a small family operation and has now grown into one of the larger carnivals in the United States and has provided midways in 18 states and the Bahamas”. The carnival currently owns approximately 60 rides and fields two units for a large part of their season and holds contracts at large fairs such as the DuQuoin Illinois State Fair, Heart of Illinois Fair in Peoria and the Panhandle South Plains Fair in Lubbock, Texas along with many others. “We are excited to be expanding our route to include Kentucky,” said Freddy Miller. “We were at a point where we felt it was time to expand and we will be coming into the state during June and July. We will feature approximately 15-25 rides at each fair and will provide the quality of rides, games and food that the people of Kentucky have come to expect at many of their county fairs,” he added. The Taylor County Fair will be the carnival’s first ever county fair in Kentucky. Litchfield emphasized that the Taylor County Fair will continue to have the Pay One Price gate admission. “Our contract with the Miller’s calls for us to continue as a Pay One Price fair with a $10 admission so everything will remain the same in that regards for our fair-goers. But, we will have an all-new look so it will definitely be something different for people to come check out and we’d really like to break attendance records this year so that we can impress upon the Miller’s the growth potential that our fair has,” he added. Litchfield said that Miller Spectacular Shows was selected from approximately six companies that expressed interest in the Taylor County Fair. “It’s good to know that we’ve been successful enough as a fair to draw interest from a variety of carnival companies,” said Litchfield. “The biggest factors that influenced our decision were that we could keep our first week of June date with Miller along with the fact that they will bring a new, never before seen carnival midway into Kentucky and we will be their very first fair here,” he said. 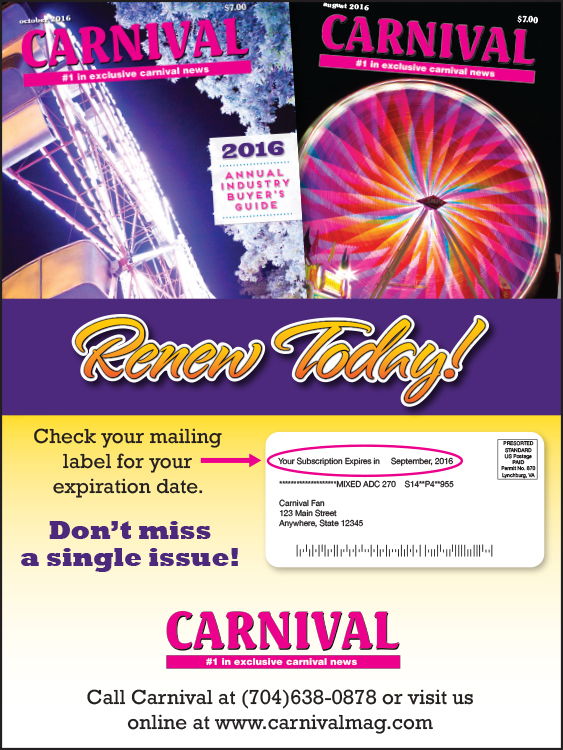 More information on Miller Spectacular Shows is available on line at www.millercarnival.com. The 2014 Taylor County Fair will be May 31-June 7 with the midway opening on Monday, June 2. Carnival Magazine has learned the Bud Gilmore passed away this week. Bud was the owner of Smokey's Greater Shows based in Maine. He was a member of the industry for his entire life, his family traveling with a 3,200 pound horse when Bud was only four or five. An article about Bud Gilmore and Smokey's Greater Shows appears in the February 2011 issue of Carnival Magazine. Our deepest regrets to the Gilmore family, Bud's friends, and everyone at Smokey Greater Shows. Frank Zaitshik informed Carnival Magazine that Wade Shows will take delivery on a third large roller coaster to premier on their midway in 2014. The 10 trailer Wildcat Coaster will be themed Comet II and measures 215-feet long by 75-feet deep. The piece joins two other large roller coasters in the Wade Shows ride inventory. It is set to premier at next year’s Florida State Fair. The show will also premier a Huss Rainbow next year at the South Florida Fair in West Palm Beach, FL. Powers Great American Midways took delivery of their new Wisdom Rampage, themed Stampede, at the 2013 North Carolina State Fair. Wisdom Rides was able to deliver the new ride despite historic floods in Colorado that delayed production. Last minute modifications to the ride were also made to reduce the travel weight of the piece prior to delivery. Click here to see photos of Stampede's innaugural setup. Press Release from Allied International Holdings, Inc.